Sinn Féin has described a controversial video posted by one of its MPs and said to mock IRA victims as "inexcusable" and "indefensible". Declan Kearney expressed the party's "deep regret" over the "huge offence" caused by Barry McElduff's post. The video, posted on Twitter on Friday, showed the MP with a loaf of Kingsmill bread on his head on the anniversary of the Kingsmills massacre. Ten Protestants were murdered by the IRA in the massacre on 5 January 1976. Mr McElduff has apologised and said he did not realise there could be a possible link between the bread brand and the anniversary. Party colleague Máirtín Ó Muilleoir has also apologised for retweeting the video. He said he saw the tweet as being "wholly apolitical and retweeted it on that basis". Image caption Máirtín Ó Muilleoir said he retweeted the video as he believed it was "wholly apolitical"
"Once it was pointed out that the tweet had offended and hurt people and that Barry had rightly deleted his tweet, I retweeted his apology and, of course, apologise unreservedly for the pain and hurt caused by my retweet," he said. Mr McElduff is meeting Sinn Féin leaders on Monday. Mr Kearney said the meeting would be an opportunity for the party leadership to record its "very serious disapproval" of the situation and discuss the "serious fall-out". 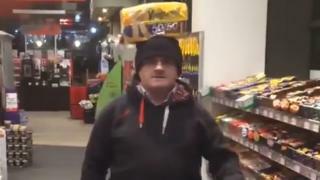 In the original Twitter post, Mr McElduff said he was in a service station, then, mentioning the name of the shop, asked where they kept their bread while balancing a loaf on his head. The well-known brand of bread shares a very similar name with the south Armagh village that witnessed one of the most notorious incidents of the Troubles, when gunmen stopped a van carrying textile workers on their way home, identified the Protestant occupants, lined them up at the side of the road and shot them. Ulster Unionist Danny Kennedy told BBC Radio Ulster it had been a "grim" weekend for those affected by the massacre. He said the anniversary was a time of "raw emotion" and that hurt had been compounded by Mr McElduff and Mr Ó Muilleoir. He rejected the idea that the choice of bread was a coincidence and said Mr McElduff's apology was neither "genuine or sincere". "Of the thousands of items in the shop, he chose bread," he said. "Of all the bread brands, he chose Kingsmill and of all the days to do it, it was the 42nd anniversary of the Kingsmills massacre. How sick is that?" Democratic Unionist Party MP Emma Little-Pengelly said she had been contacted by people from all sections of the community who wanted to express their disgust. "The view is that he was giving a nod to people who want to make a mockery of victims," she said. "Even if it was unintentional, when it was pointed out to him that people were being hurt by it, he should have taken it down immediately. "He only took it down much much later after being contacted by a newspaper." She said there had been no detailed explanation for the "bizarre video" from Mr McElduff, who has a history of putting items on his head and posting the pictures on social media. There was a wider issue of rights and respect, she added, and said it was "appalling" that no senior Sinn Féin figure had spoken out over the weekend. The only survivor of the Kingsmills massacre has said he believed the video was "depraved" and "designed to hurt". Alan Black, who survived despite being shot 18 times, said he did not accept Mr McElduff's apology. "It was like a punch to the stomach, it was so callous. To mock the dead and dance on their graves is depraved," he said. "He just wanted to hurt the Kingsmills families, but it's hurt a lot of people across the north of Ireland. He had to backtrack and give a half apology." Mr McElduff has offered to meet families of the victims, but Mr Black said he was not interested in this. "Absolutely not. I steer clear of bigots no matter where they come from," he said. Colin Worton, whose brother Kenneth was one of those murdered, said Mr McElduff's apology was not "heartfelt". "He's not sorry for the video that he's posted, he's sorrier for what's happened in the aftermath," he said. "If there's any decency left in McElduff's DNA, he should resign." The police have said they have received "a number of reports of a post on a social media platform, made by a local public representative. Enquiries are ongoing."